If you're looking for a great (and cheap!) hotel in Orlando, CheapTickets is the best place to find them. We offer deals on the best 2362 hotels throughout Orlando. No matter what you're looking for, we have options for you. 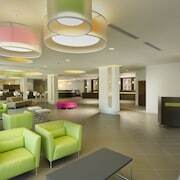 Grab great rates on the 1467 affordable 3-star hotels that are easy on the wallet without sacrificing comfort. Looking for more luxury? Try one of the 324, 4-star hotel accommodations in Orlando. No matter your budget needs, we've pulled out all the stops to make sure you have plenty of vacation options. Maybe you prefer to search for your hotel deals based on what each hotel offers? For example, let's say you just want to find a hotel or resort that has a pool to cool off in after a long day exploring Orlando. Scroll down to choose from the 575 hotels in Orlando that has a pool for guests. Or search for deals on Orlando hotels offering free wifi or breakfast, non-smoking rooms, and more! CheapTickets is here to be your personal travel agent for your next trip to Orlando. Get booking today! What hotels in Orlando offer free wifi access? Are there deals on Orlando hotels offering free breakfast? Yes! The only thing better than finding a great deal on a cheap hotel in Orlando is finding one that offers free breakfast. Grab some eggs, a waffle, or some healthy oatmeal before a day full of exploring Orlando and all that it has to offer. Below are just some of the many hotels that offer free breakfast in Orlando. Wyndham Grand Orlando Resort Bonnet Creek is a 4.00 star rated hotel property in Orlando that offers free breakfast. 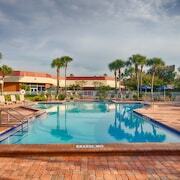 Maingate Lakeside Resort is a 3.00 star rated hotel property in Orlando that offers free breakfast. Holiday Inn Resort Orlando Suites - Waterpark is a 3.50 star rated hotel property in Orlando that offers free breakfast. Orlando Metropolitan Resort is a 2.50 star rated hotel property in Orlando that offers free breakfast. What about deals on pet-friendly hotels in Orlando? Orlando is a great place to get outside and explore with your pets in tow so don't leave your furry friends behind. Below you'll find great deals on hotels in Orlando that allow pets. Don't forget to bring plenty of treats! The Point Hotel & Suites is a popular, pet-friendly, 3.50 star hotel in Orlando. Disney's Fort Wilderness Resort & Campground is a popular, pet-friendly, 3.50 star hotel in Orlando. Blue Heron Beach Resort is a popular, pet-friendly, 3.50 star hotel in Orlando. Liki Tiki Village by Diamond Resorts is a popular, pet-friendly, 3.50 star hotel in Orlando. Any good rates on Orlando hotels with restaurants? Absolutely. Don't want to deal with planning our all your meals on your trip to Orlando? We don't blame you. Keep the hangry away by staying in one of the 223 hotels that have restaurants. With a room at one of these spots, all it takes to get a good meal is hopping in the elevator. Check out some of the most popular hotels in Orlando that have restaurants below. Book Red Lion Hotel Orlando - Kissimmee MaingateRed Lion Hotel Orlando - Kissimmee Maingate is a 3.00 star hotel and has one or more restaurant options. Book Disney's Caribbean Beach ResortDisney's Caribbean Beach Resort is a 3.50 star hotel and has one or more restaurant options. Book Westgate Lakes Resort & Spa Universal Studios AreaWestgate Lakes Resort & Spa Universal Studios Area is a 4.00 star hotel and has one or more restaurant options. Book Disney's Grand Floridian Resort & SpaDisney's Grand Floridian Resort & Spa is a 4.50 star hotel and has one or more restaurant options. What are the cheapest hotels in Orlando with pools? What's better after a long day exploring Orlando then a relaxing dip in a pool? Finding the Orlando hotel you need for a bargain! Cool off and unwind at one of our 575 Orlando hotels with a pool. Browse some of the top deals on these hotels and resorts with pools in Orlando below, but be warned: You may not want to check out! Orlando World Center Marriott has a pool and a 4.00 star rating. 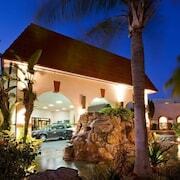 Mystic Dunes Resort & Golf Club by Diamond Resorts has a pool and a 3.50 star rating. 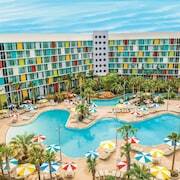 Universal's Loews Royal Pacific Resort has a pool and a 4.00 star rating. Universal's Hard Rock Hotel ® has a pool and a 4.00 star rating. What hotels in Orlando offer parking for guests? Once you've made your way to Orlando, the last thing you want to deal with is finding parking close to your hotel. Avoid the hassle of parking around the block and carrying your luggage all the way to the lobby by booking one of our hotels with parking. Check out deals on some of the 525 hotels in Orlando that offer parking for guests. Sheraton Lake Buena Vista Resort This hotel has a 4.00-star rating. Best Western Lake Buena Vista - Disney Springs® Resort Area This hotel has a 3.00-star rating. Grande Villas Resort by Diamond Resorts This hotel has a 3.50-star rating. Radisson Hotel Orlando-Lake Buena Vista This hotel has a 3.50-star rating. Do Orlando hotels offer 24-hour concierge services? When you're on vacation, things don't always go according to plan. Travel with peace of mind when you book one of our 196 hotels in Orlando with 24-hour concierge service. That way you know help is always phone call or elevator ride away. 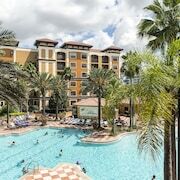 Try Allure Resort Orlando. It's a 3.50 star rated hotel in Orlando that offers concierge services 24 hours a day. 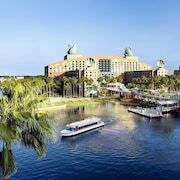 Try Lake Buena Vista Resort Village & Spa a staySky Hotel/Resort. It's a 4.00 star rated hotel in Orlando that offers concierge services 24 hours a day. Try B Resort and Spa located in Disney Springs® Resort Area. It's a 4.00 star rated hotel in Orlando that offers concierge services 24 hours a day. Try Universal's Hard Rock Hotel ®. It's a 4.00 star rated hotel in Orlando that offers concierge services 24 hours a day. What about low rates on non-smoking hotels in Orlando? Disney's BoardWalk Inn This hotel has a 4.00-star rating. 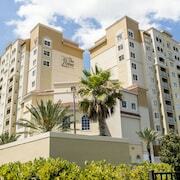 Westgate Palace a Two Bedroom Condo Resort This hotel has a 4.00-star rating. 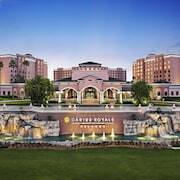 Caribe Royale All-Suite Hotel This hotel has a 4.00-star rating. Hyatt Regency Grand Cypress This hotel has a 4.00-star rating. What are the cheapest Orlando 3-star hotel deals? Our 3-star hotels bring you quality accommodations at a lower price point for the perfect, budget-friendly vacation in Orlando. With 1467 3-star hotels throughout Orlando to choose from, you still have options. Browse our selection below. Disney's Pop Century Resort. Situated less than 1 mile from <strong>Disney’s Hollywood Studios</strong> this resort is a whimsical time capsule of late 20th-century pop culture. 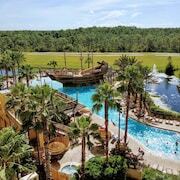 Holiday Inn Resort Orlando Suites - Waterpark. This family-friendly Orlando resort is located in the entertainment district, within 3 mi (5 km) of Lake Buena Vista Factory Stores, Old Town and Orlando Premium Outlets Vineland Ave. Lake Bryan and Lake Cecile are also within 3 mi (5 km). Disney's Port Orleans Resort - Riverside. Inspired by the days of riverboats and Mark Twain, this Louisiana-style resort sprawls along waterways 1 mile from <B>Epcot</B> and 5 miles from the <B>Magic Kingdom</B> Park. Disney's Art of Animation Resort. 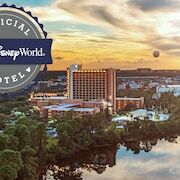 This family-friendly <b>Walt Disney World</b> Resort hotel in Lake Buena Vista, Florida, is within 2 miles (3 km) of ESPN Wide World of Sports and Disney's Boardwalk. <b>Disney's Hollywood Studios</b>® and <b>Epcot</b>® are also within 3 miles (5 km). What are the best deals on 4-Star Hotels in Orlando? Orlando is full of hotels and it can be hard to narrow down where you really want to stay. Luckily, we've done that hard work for you be narrowing you from 2362 hotels throughout Orlando, to the 324 4-star hotels in Orlando. Our 4-star hotels in Orlando are exactly what you need for your next family trip, romantic weekend, or solo getaway. Check out our most popular deals below. Caribe Royale All-Suite Hotel: This all-suite hotel with its own convention center is within 6 miles of <b>Walt Disney World</b> Resort, Universal Orlando, SeaWorld, and the Orlando Convention Center. Disney's Animal Kingdom Lodge: 2 miles west of <b>Disney's Animal Kingdom</b> Theme Park via complimentary shuttle, this resort with a thatched roof and African artifacts features its own 33-acre savannah, where exotic animals graze. Disney's Grand Floridian Resort & Spa: The crown jewel of <b>Walt Disney World</b> Resort is this Victorian-themed hotel on the shores of the Seven Seas Lagoon; a monorail just off the lobby zips to the <b>Magic Kingdom</b> Park and <b>Epcot</b>. Universal's Loews Royal Pacific Resort: The 1000-room hotel is located just a short walk, or complimentary water taxi or shuttle bus ride to Universal Studios Florida®, Universal’s Islands of Adventure®, and Universal CityWalk® entertainment complex. What are the best activities to do in Orlando? Walt Disney World® Resort Magic Your Way Ticket: Starting at just $132 per person. Blue Man Group: Starting at just $64 per person. Full-Day Miami Tour: Starting at just $99 per person. Gatorland Admission: Starting at just $24 per person. Property was very nice! We will definitely stay here again! I loved that it is primarily focused on kids enjoyment. My son had so much fun at the pool and playing in the play area they have. The room appeared very clean but when it came up to the point of sleeping in the bed it smelled like old people perfume. As if they had only done the bed and not changed the sheets. I called the front desk and they immediately fixed the problem, no questions asked. I loved that they had breakfast it was always very good and the staff was always amazing and super nice. Pool, restaurants and spa were amazing. Our room had very little spiders around the mini fridge and the faucet in the shower was loose. I think the bathroom overall could have been cleaner upon check-in. I advised the front desk of these issues at checkout and she did take notes. We had a lovely time and we're so tired after the parks we pretty much just crashed once we got back.